SITC 2018 Presidential Session presentation on Saturday, Nov. 10, 2018. Steven F. Powell, MD (Sanford Health, Sioux Falls, SD, USA) detailed first-in-human data for application of the novel oncolytic virus Voyager V1 (VV1) for treatment of patients with solid tumors including squamous cell carcinoma of the head and neck, colon, rectal, pancreatic, and breast, among other cancers. VV1 is derived from the vesicular stomatitis virus and encodes IFNbeta to help amplify anti-tumor efficacy, as well as the thyroidal sodium iodide symporter NIS gene to allow for noninvasive imaging of virus dissemination. Administered as a one-time intratumoral injection, VV1 was well tolerated in patients with 80% of treatment related AEs reported being short-lived as well as mild to moderate in severity. Interestingly, VV1 proliferation and spread, determined by positive SPECT/CT within the tumor, was more readily observed in colorectal and pancreatic cancers compared to other diseases. Additionally, IFNbeta was detected in the serum of patients treated with high VV1 doses, indicative of viral replication within the tumor. Importantly, there was evidence of intratumoral inflammation in 75% of evaluable patients, and T cell infiltration was observed up to 29 days post-therapy in non-injected lesions. Overall, these data indicate that VV1 is well tolerated as a single-agent, and that it may promote inflammation and immunity at both injected and non-injected tumors. Having demonstrated synergistic effects with anti-PD-1/PD-L1 antibodies in preclinical models, future evaluations of VV1 in combination with the anti-PD-L1 avelumab are planned. Yu Cao, PhD (H. Lee Moffitt Cancer Center, Tampa, FL, USA) discussed research evaluating the role of C/EBP-homologous protein Chop in the regulation of CD8+ T cell effector function in the tumor microenvironment. Data indicate that Chop is upregulated in tumor-associated CD8+ T cells from human ovarian cancer samples, but not in circulating CD8+ T cells. Furthermore, ovarian cancer patients with CD8+ T cells expressing high-levels of Chop have reduced survival compared to patients with Low-Chop expressing intra-tumor CD8+ T cells (p = 0.05). Next-generation sequencing analyses revealed overexpression of signatures associated with effector function in Chop-negative CD8+ T cells. Accordingly, Chop-negative CD8+ T cells displayed increased anti-tumor activity. Further experiments showed that Chop deletion in T cells results in increased expression of T-bet – the master regulator of effector T cell function. Interestingly, a Chop binding site was identified within the promoter region of T-bet, and subsequent experiments revealed that Chop in fact binds to T-bet promoter and directly inhibits T-bet transcription. Finally, adoptively transferred Chop-negative CD8+ T cells more efficiently controlled tumor growth in B16-bearing mice compared to Chop-positive cells. Together, these data suggest that Chop directly inhibits T-bet transcription and regulates CD8+ T cell effector function, offering a new potential target to augment immunotherapeutic efficacy. Lawrence Fong, MD (University of California, San Francisco, CA, USA) reported data from a phase 1b clinical trial (NCT02655822) evaluating CPI-444 - an oral antagonist of the adenosine 2A receptor (A2AR) - as monotherapy or in combination with anti-PD-L1 atezolizumab for the treatment of patients with relapsed/refractory renal cell carcinoma (RCC). Patients (median three prior treatments, 71 percent prior-immunotherapy) received either CPI-444 (100mg BID) as a monotherapy (n=33) or in combination with atezolizumab (800 mg Q2W, n=35). At median follow up of 8.7 months, overall survival was 65% and 88% for the monotherapy and combination cohorts, respectively. In addition, median progression-free survival in the monotherapy cohort was 4.1 mos, and 5.8 mos patients receiving combination CPI-444 + atezolizumab. 6-month disease control rates (DCR) were 25% and 32% for the monotherapy and combination cohorts, respectively. Median time to best tumor response was 3.4 months for the monotherapy cohort and 5.5 months for the combination cohort. CPI-444 was well tolerated with mostly low-grade treatment-related adverse events. Increased CD8+ T cell infiltration positively correlated with improved 6-month DCR. Analyses revealed that clinical response was only seen in patients with high tumor-adenosine signatures. In summary, data suggest early clinical benefit of CPI-444 monotherapy or in combination with atezolizumab in patients with relapsed/refractory RCC, and that tumor adenosine gene signatures may be a potential biomarker of response. 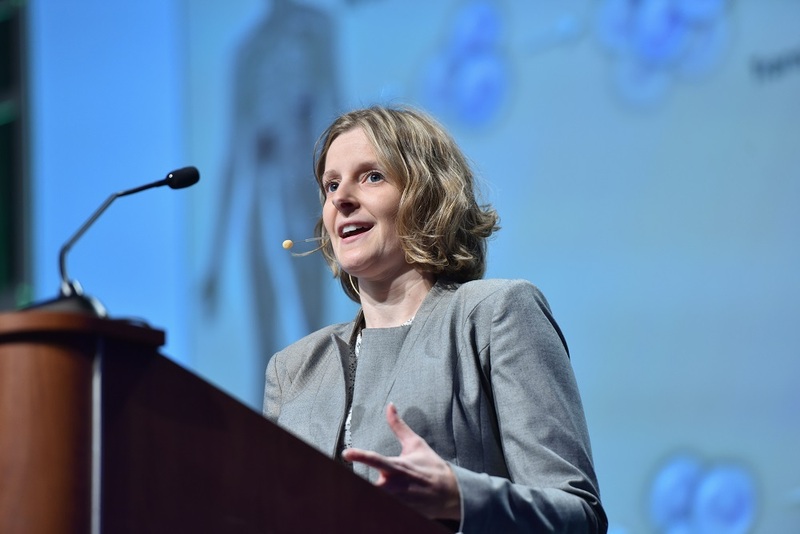 Kristin Anderson, PhD (Fred Hutchinson Cancer Research Center, Seattle, WA, USA) presented data demonstrating how an immunomodulatory fusion protein targeting Fas ligand (FasL) can enhance survival of adoptive TCR-transduced T cells in a pre-clinical ovarian cancer model. In collaboration with Dr. Philip Greenberg's group, Dr. Anderson utilized adoptive T cells that harbor a genetically-engineered TCR receptor targeting mesothelin (TCR-Mslin) as a potential therapeutic to treat patients with ovarian cancer. Results indicate that TCR-Mslin T cells have anti-tumor activity in vitro, but have limited persistence and reduced effector function in pre-clinical ID8-VEGF tumors that mimic human ovarian cancer phenotypes. Multiple adoptive transferes of TCR-Mslin T cells increased survival of mice bearing ID8-VEGF tumors, but this strategy has limited translational potential in humans. As such, Anderson’s group developed a FasL/4-1BB immunomodulatory fusion protein to help increase CD8+ T cell proliferation and survival. FasL/4-1BB CD8+ T Cells had increased proliferation ability, as well as increased cytokine secretion including IFNgamma and TNFalpha. Enhanced survival was noted in mice bearing ID8-VEGF tumors who received adoptive transfer of TCR-Mslin + FasL/4-1BB T cells when compared to mice receiving TCR-Mslin or WT CD8+ T cells. In all, these early data suggest that the described FasL/4-1BB immunomodulatory protein may help increase survival of TCR-transduced CD8+ T cells, and may be a potential technology to help facilitate movement of TCR-T cells into the clinic. Gabriel Abril-Rodriguez (UCLA, Los Angeles, CA, USA) discussed analyses of tumor samples from patients with metastatic melanoma treated with anti-PD-1 therapy to help identify mechanisms leading to tumoral immune cell exclusion. RNAseq analyses performed on tumor samples from 41 melanoma patients demonstrated that low CD8+ T cell and dendritic cell infiltration an inverse correlation correlate with upregulation of P21 activated Kinase 4 (PAK4). PAK4 is a kinase that binds to and phosphorylates beta-catenin to activate Wnt signaling, and is known to be involved in tumorigenesis. This observation was further supported by analyses of TCGA gene expression data from 32 cancer types showing a negative correlation between PAK4 expression and clinical responses in patients with melanoma, prostate cancer, and pancreatic cancer, among others. Syngeneic C57BL/6 mice bearing B16 PAK4 knockout tumors were sensitized to PD-1 inhibition compared to mice bearing B16 wildtype tumors that were resistant to checkpoint blockade, and PAK4 knockout tumors displayed increased CD8+ and dendritic cell infiltration compared to WT tumors. Anti-PD-1 efficacy was lost upon depletion of CD8+ T cells in PAK4 knockout tumors. Importantly, treatment of B16 melanoma models with anti-PAK4 and anti-PD-1 significantly reduced tumor growth compared to mice treated with each agent alone. Together, these data suggest that PAK4 may contribute to tumor immune evasion, and that inhibition of PAK4 may help overcome resistance to PD-1 blockade. Sangeetha Reddy, MD, MSci (MD Anderson Cancer Center, Houston, TX, USA) presented research towards the identification of immune cell profiles of response in patients from a randomized trial (NCT02519322) evaluating efficacy of neoadjuvant immune checkpoint blockade in patients with high-risk resectable melanoma. A total of 23 patients were randomized to receive neoadjuvant nivolumab (n = 12) or neoadjuvant ipilimumab + nivolumab (n = 11), and tumor samples were analyzed using transcriptomic profiling. Typical biomarkers associated with response to immune checkpoint inhibitors – including PD-L1 and CD8 – were observed in patient tumor samples. Interestingly, tumor B cell signatures were also differentially expressed according to patient response, including MZB1, JCHAIN, and IGLL5 (p less than 0.0001 for each). B cell lineage score was also correlated with improved survival, especially in patients who had low CD8+ T cell signatures in their respective tumor samples. Interestingly, data from a similar trials evaluating neoadjuvant immune checkpoint inhibition in patients with metastatic RCC (NCT02210117), as well as melanoma samples within the TCGA dataset displayed immune signature patterns to the observed melanoma trial dataset. Multiplex immunohistochemostry of tumor sections from the melanoma trial cohort demonstrated co-localization of the B cells and CD8+, CD4+ T cells, as well as CD21 follicular dendritic cells, in tertiary lymphoid structures or responders (p = 0.037 at baseline, p = 0.002 on-treatment). Together, these results suggest that B cell genetic signatures may serve as prognostic and predictive biomarkers for response to neoadjuvant immune checkpoint blockade. Matthew Beatty (Moffitt Cancer Center, Tampa, FL, USA) detailed novel data describing how enrichment of CD8+ stem memory T cells (Tscm) in adoptive T cell therapy products associates with response in patients with advanced melanoma. In all, 57 patients with stage IV melanoma (anti-PD-1 naïve) were enrolled across four trials and 47 patients received adoptive therapy with tumor-infiltrating lymphocytes (TIL). Overall response rate (ORR) in the treated patients was nearly 39 percent. Interestingly, CD8+ Tscm cell and overall TIL persistence were increased in patients with complete or partial response compared to patients who demonstrated stable or progressive disease (per RECIST). Increased five-year PFS (36.5 months) was observed in patients with high levels of Tscm (greater than 7.81 percent), compared to patients with low levels of Tscm (less than 7.81 percent; seven months). Furthermore, T cell clones derived from infusion product CD8+ Tscm were shown to persist/expand in vivo at six weeks post-infusion, and there was a positive association between CD8+ Tscm abundance and one-year clinical response. In addition, purified patient CD8+ Tscm demonstrated anti-tumor reactivity as well as ability to differentiate into additional memory T cell subsets six weeks post-infusion. In summary, CD8+ Tscm abundance in adoptive TIL infusion products may indicate increased anti-tumor efficacy in patients with advanced melanoma who have not received prior anti-PD-1 treatment. Hiroshi Yano, BS (University of Pittsburgh, Pittsburgh, PA, USA) presented research investigating the cooperative regulation of anti-tumor immunity in the tumor microenvironment by IL35 and IL10. Researchers discovered that deletion of IL10, IL35, and IL10/IL35 similarly lead to reductions in in vivo B16-melanoma growth. Interestingly, IL10 and IL35 deficiency individually reduced CD8+ inhibitory receptor expression – including TIM3, TIGIT, and PD-1. IFNgamma and TNFalpha secretion, however, were differentially regulated by IL10 and IL35, as well as CD8 memory T cell differentiation. Towards elucidating a potential mechanism, Yano’s group analyzed CD8+ T cell subsets from IL10 and IL35 deficient mice and noted increased expression of BLIMP1 – a known regulator of T cell inhibitory receptor expression. Further experiments demonstrated that IL10 and IL35 directly inhibit BLIMP1 expression, thus explaining CD8+ T cell inhibitory receptor down-regulation in IL10 and IL35 deficient mice. Together, these data help describe a mechanism of how IL10 and IL35 can contribute to CD8+ T cell anti-tumor activity through direct regulation of BLIMP1 and control of inhibitory receptor expression, but also differentially regulate cytokine secretion and memory cell expansion.